Those women who need methyl folate instead of folic acid, now have a one-a-day prenatal to call their own! 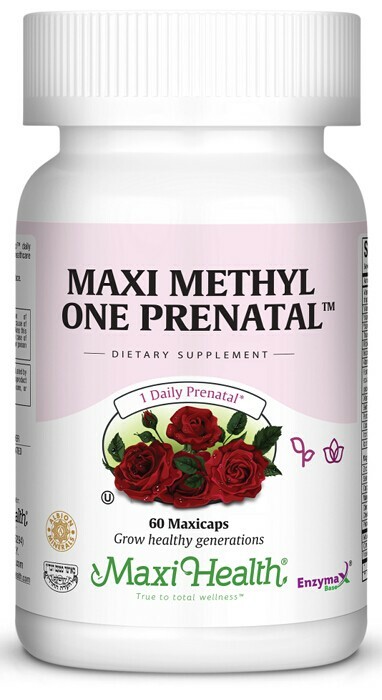 It’s Maxi Methyl One Prenatal™ from your health partners at Maxi Health Research®. We developed it to ensure your health, energy, and the health of your fetus. This comprehensive supplement will provide you with the essential nutrients you need. Including the form of folic acid you can readily absorb. The Maxi Methyl One Prenatal™ has amino acid chelates which are minerals and trace elements with maximum bioavailability, tolerability and safety. We use only the finest from Albion Labs formulated to survive the gastro-intestinal system, and protect the sensitive mucosal membranes of the stomach and intestines from irritation. Vitamin C supports blood vessels, capillary and vein strength, and helps support a healthy immune system. Natural Vitamin E (d-alpha tocopheryl succinate) has been found to be superior in absorption to the synthetic forms (dl type) and its respective acetates. ChromeMate chromium (chromium polynicotinate) has been found to be 18 times more biologically active than other chromium compounds is an organic complex that contains niacin as well as cysteine and other nutrients. Biotin is a cofactor for several enzymes, and is essential for carbohydrate metabolism and the synthesis of proteins. Biotin supports the growth and development of healthy nerve tissue and aids in the use of B vitamins and synthesis of ascorbic acid. Pantothenic acid supports a healthy immune system and also aids in the production of hormones. It is essential for proper metabolism of food and is vital during pregnancy. Iron (as Ferrochel) is a patented, nutritionally functional amino acid chelate form of iron. Magnesium (magnesium citrate) a natural source of magnesium, provides the body with additional magnesium as well as a non-irritating stool softener much needed during pregnancy. Inositol provides the nutrient necessary to make cellular membranes. Click on the Directions & Supplement Facts tab to see all that Maxi Methyl One Prenatal™ has to offer. It's your bundle of joy; handle with care by taking one capsule of Maxi Methyl One Prenatal™ daily. Take one (1) Maxicap™ daily with meals, or as directed by a healthcare practitioner. Other Ingredients: Vegetable cellulose, spearmint leaves, vegetable magnesium stearate, rice flour, Enzymax® (calcium carbonate, bromelain, papain, lipase, amylase, protease, silica), ginger root powder, Earthrise® Spirulina (Arthrospira platensis) (microalgae), and chlorophyll. This product contains NO wheat, salt, gluten, soy, milk, artificial flavors or colorings. Dimacal® is a registered trademark of Albion Laboratories, Inc.